DARA & ED'S GREAT BIG ADVENTURE sees friends and fellow comedians Dara Ó Briain and Ed Byrne embarking on an epic journey, on what has been described as one of the greatest roads in the world, the Pan-American Highway. Dara and Ed retrace the steps of three famous American adventurers from the 1940s who set out on a rugged expedition which paved the way for the building of the road. Within a few years of their mission, the creation of the highway began to transform the Americas, kick-starting businesses and industry along its route. 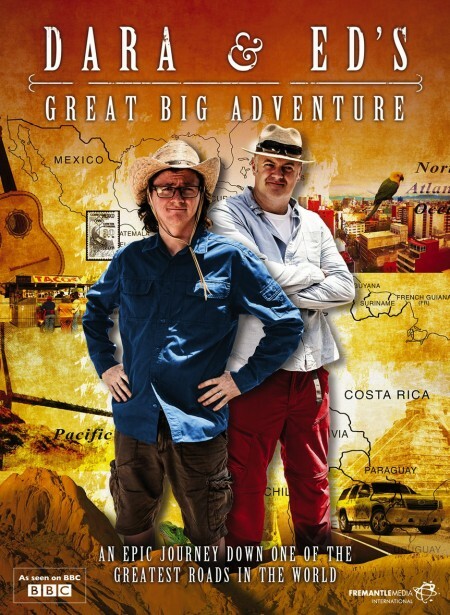 Dara and Ed, inspired by the archive footage filmed on the original expedition and following the travelogue written by Sullivan C Richardson, one of the three adventurers, embark on their own mammoth trip that will take them from the USA to Panama. Armed with a slightly more modern version of the Plymouth saloon car used by the original travellers, Dara and Ed take the challenge set by the 1940s adventurers and blaze a new trail through some of the most dynamic countries on the planet, capturing all the danger and excitement the route has in store.